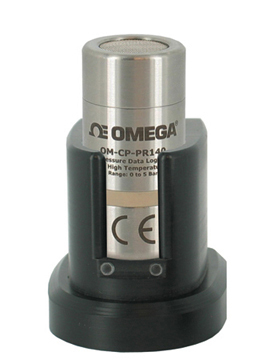 The OM-CP-PR140 is a pressure data logger designed for use in autoclave validation and mapping. 20 to 140°C (68 to 284°F). The OM-CP-PR140 can be programmed to take readings as often as once per second (1 Hz), and has non-volatile memory that can store up to 32,700 measurements. Simply place the OM-CP-PR140 in the OM-CP-IFC400 docking station, connect to an available USB port on your computer, and the device can be started, stopped or downloaded using our user friendly software. Graphical, tabular and summary data is provided for analysis and can be viewed in psia, mmHg, bar, Torr and kPa. The data can also be automatically exported to Excel® for further calculations. The storage medium is non-volatile solid state memory, providing maximum data security even if the battery becomes discharged. Nota: Comes complete with 3.6V lithium battery. Operator’s manual and USB interface cable are included with the OM-CP-IFC400 software/cable package (required for data logger operation, sold separately).